Martin Seeber Garden Design are a passionate young company based near Ponteland and the edge of the Northumberland National Park. We love creating and maintaining wonderful gardens for our clients. If we had to describe ourselves we’d probably say caring, professional and flexible. We can design your garden for you, we can build it, and we can maintain it. We can work with you through the entire process, or simply pick up where you need us. We work in partnership with our clients, involving them in every step of the process. Sharing thoughts, providing guidance and listening to your ideas. The result is a garden that is unique and designed to be perfect for you. A well designed garden, with tender care, will mature into a work of art. We are always available to offer you all the support and advice you need. Martin Seeber is an enthusiastic and dedicated garden designer. He studied horticulture at Kirkley Hall College, and has worked on numerous gardening projects from small town house plots to large country gardens. Martin is an expert on trees, plants and flowers. 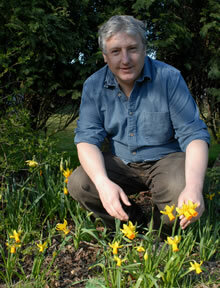 Extending nature into the garden is his passion: inviting in birds, bees and butterflies to create a tranquil haven. Visionary and imaginative, he is equally at home creating stunning contemporary themes with strong colours contrasting clever use of stonework. Our garden design service helps you realise the garden of your dreams. A beautiful, professionally designed garden that looks wonderful every season of the year, and matures into your pride and joy. Our designer works hand in hand with you delivering a final design, planting, build and colour scheme. Discover how our experience and creative vision can transform your garden. Sit back and relax, and let us take care of your garden build from start to finish. We’ll source the materials, arrange the contractors, and project manage your entire garden build. Our experienced staff will expertly construct all features of your garden, bringing your garden design to life. From reviving an overgrown garden to a regular trim and tidy, we’ll keep your garden in tip-top condition. Our professionally trained gardeners will help you maintain a garden that you can use all year round. We offer grass cutting, reseeding, moss control, planting, pruning, landscaping, fencing, decking, and paths.